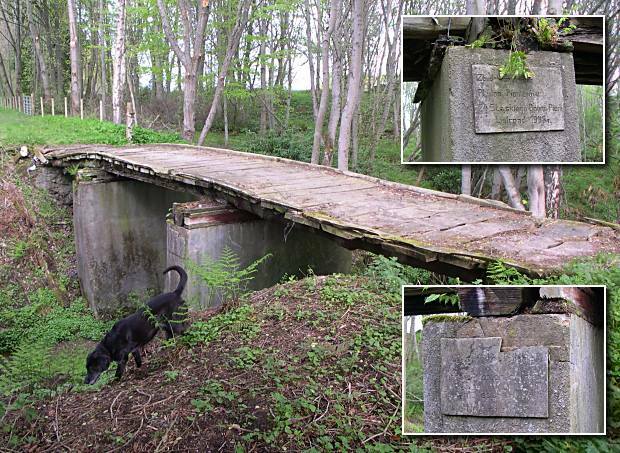 This bridge on the driveway between Cromarty House and it's Gate Lodge on the Denny, was built by Polish soldiers during the second world war. There are two concrete plaques on the south sides of the two piers. The left hand one (shown top) is in Polish. The right-hand one says"Erected by the Polish Pioneer Platoon of the 24th Silesian Inf Br - November 1945"
Clem Watson has left some info on picture #55. Garve, Thanks for going specially to photograph the plaques, the Poles were very much part of Cromarty's way of life in the early 40's. They were also responsible for being on 'point duty' at the former Bank of Scotland junction near your office, because there was so much military traffic! They were even provided with white arm covers! Busy place Cromarty during the '39-'45 period. I'm led to believe my grandfather (Jozef Kniarzyk) was the last pole to survive who helped erect the Polish bridge as it is widely known in Cromarty, and who sadly has passed away now... The bridge however, has now been restored with a new surface and capable of carrying a tractor and trailer laden with wood without any problems and even has a cattle grid now!